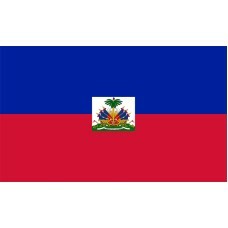 The flag of Haiti is comprised of two bands of color: blue and red. The design is modeled after the tricolor of France who used to occupy this island nation. These bands sit horizontally and in a white box centered across them in the middle of the flag is the country's coat or arms. This coat of arms consists of a green hill upon which sits a parade of weapons that signifies the defense of freedom, and a Royal palm signifying independence. On the top of the palm sits a cap of liberty and at the base of the green hill there is a white banner upon which the words "L'Union Fait La Force" sit, which translates as "Unity Makes Strength." Haiti is located in the Caribbean Sea on a large island called Hispaniola but it only occupies about 3/8 of the land at the western end as the rest of the island is the country of The Dominican Republic. This island has a very interesting history starting with the fact that it was first discovered by Christopher Columbus in 1492 and initially he thought he had found China or India. When Columbus's flagship ran aground on the island on Christmas Day in 1492 and his crew had to rescue what they could and take refuge on the island, he named it La Navidad after the date of Christmas Day. It became the first part of the Americas that was settled by Europeans and once Spain claimed it as theirs they named it La Espanola. The Spanish kept control of it until the early seventeenth century when they then ceded the part that is now known as Haiti to France who named it Saint-Domingue. Under French rule, the island became rich in sugar cane plantations using slaves from Africa as the workforce. These slaves were instrumental in gaining independence of the island from France. They and the "people of free color" took advantage of the disruption caused by the revolution in France to stage their own revolution in Haiti. Through this they achieved the abolition of slavery on the island and the island become an independent sovereign state on January 1st, 1804. This is the only time that a slave revolt had led to the creation of an independent country where all the first leaders of the government of the country were former slaves. There are stories of how the flag came to be and it has gone through a number of changes until it became the flag that is in use today. 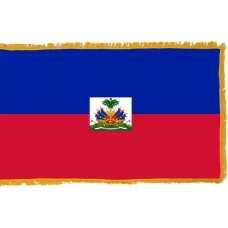 Haitian myth tells how the first flag of the Haitian Republic came into being when the appointed revolutionary leade - Jean-Jacques Dessalines took the French Tricolor and tore out the white center band. He then instructed his God daughter, Catherine Flon to sew the two remaining bands together. The blue part would now represent the slaves and the red part now represent the people of free color who together brought about the country's independence. Based on this story and how the nation came to be, it is perhaps why the flag of Haiti is so important to its people and celebrated with them holding a flag day on May 18th every year.